But only if you're cool with red and black. NZXT has been on my mind a lot lately. From the false alarm last year that it would be making a console for Soulja Boy to the fact that it sent me a rubber chicken in the mail on Tuesday, I can't seem to escape the omnipresent, LA-based computer hardware company. 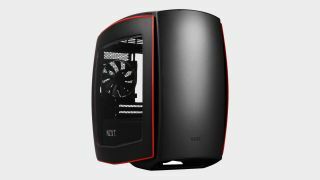 And now its most voluptuous mini-ITX case is on sale for $89.99 over on Newegg. A potbellied PC case with room to spare, the NZXT Manta is a conservatively sized alternative to some of the taller full-size ATX towers. And it's finally been marked down to a digestible price. When it released back in 2016, the NZXT Manta won over hardware reviewers with its sleek and rugged curved steel panels. Not only are they elegant in appearance, but they serve a functional purpose as well. By widening certain areas of the chassis, the Manta affords "double" the cable management space, according to NZXT. I'm not sure what it's being compared to in that statement, but it is an admittedly spacious piece of shelter for housing your beloved PC components. Measuring 16.77" x 9.65" x 17.72", the NZXT Manta can fit up to three radiators—two 280mm contraptions and one of the 120mm variety—while also accommodating even the largest ATX power supplies. Although it looks like how I feel after devouring a delicious plateful of pasta, it's swollen for a reason: so you can fit more stuff inside it. And since the side panels are transparent, you can distract guests with an RGB light show they'll never forget while you experience the certified weirdness that is YIIK: A Postmodern RPG in complete solitude. Unfortunately, only the black and red version of the Manta is on sale at the moment, so if you're looking to class up your rig with a case that's wholly black or a combination of white and black, you're out of luck. That said, if red and black suits the style of your homey setup, a 36 percent discount off an already great case is nothing to complain about. After all, upon reading some of the reviews, it's apparent that the main criticisms of this case had to do with its initially intimidating price point. Now, that's a concern of the past.